"When Bilbo opened his eyes, he wondered if he had; for it was just as dark with them shut. No one was anywhere near him. Just imagine his fright! He could hear nothing, see nothing, and he could feel nothing except the very stone of the floor." So starts perhaps one of the most pivotal and remembered chapters in The Hobbit. In the dark, with no clue about what is going on. 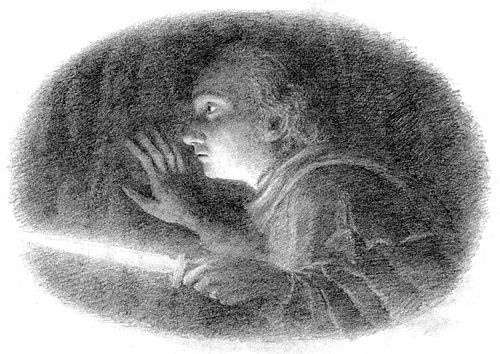 Here we see Bilbo succeed on his own first time in the face of certain danger, facing mortal threat with little more than his wits (though the glowing blade helps). Tolkien does give us hints of things to come, most notable about finding of the ring as a "turning point in his career, but he did not know it." But for all of that, he invites us into Bilbo's journey as fellow travelers. The writing is evocative of memory and feeling, with Bilbo feeling hopeful, hopeless, and inspired to bravery by the little things. Not only that, but the text is full of things like "But you must remember..." and "I should not have liked to have been in Mr. Baggins' place..." drawing us in with familiarity to the recollection of the action. Gollum is that unseen monster in the dark, one that hunts unseen on unaware prey. He could be the monster in the closet or under the bed. He is definitely horrible, with a human-like intellect and no qualms about discussing his next dinner in front of his intended (and still living) meal. 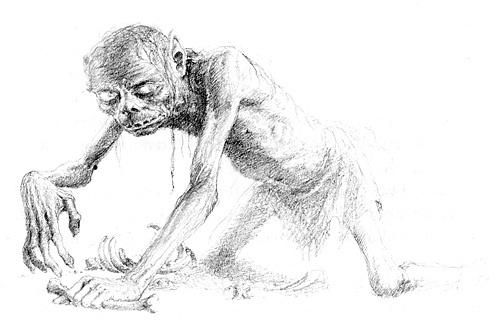 However, at the same time Gollum is incredibly frail, a creature of the dark that shaped him, but also lonely and perhaps easily defeated. Perhaps importantly, Bilbo defeats Gollumn not with violence but with wit and words. This is definitely not a book without violence, not with the trolls and goblins so far, and not with the wargs and battles ahead, but it is definitely a story in which we see the titular character outwit challenges rather than attack them. Bilbo starts out less successful at this such as with the trolls, and the fact that here he honestly gives his full name indicates some further needed growth, but as the challenges grow so does his wit. Bilbo is not the only protagonist to benefit from trickery, I spoke about Gandalf as a trickster back in Chapter 2. The wizard also eschews violent conversation when he can manipulate it otherwise, while the dwarfs do not let violence deter them from their chosen path. As for Peter Jackson's adaptation of this scene, it was near perfect. The whole chapter is done so richly. I almost feel bad complaining about the brevity of the riddle game with the excellent representation of the chapter, but then there's so much unnecessary extra bits added to Jackson's films that could have been pruned back a few minutes to allow us a few extra riddles. 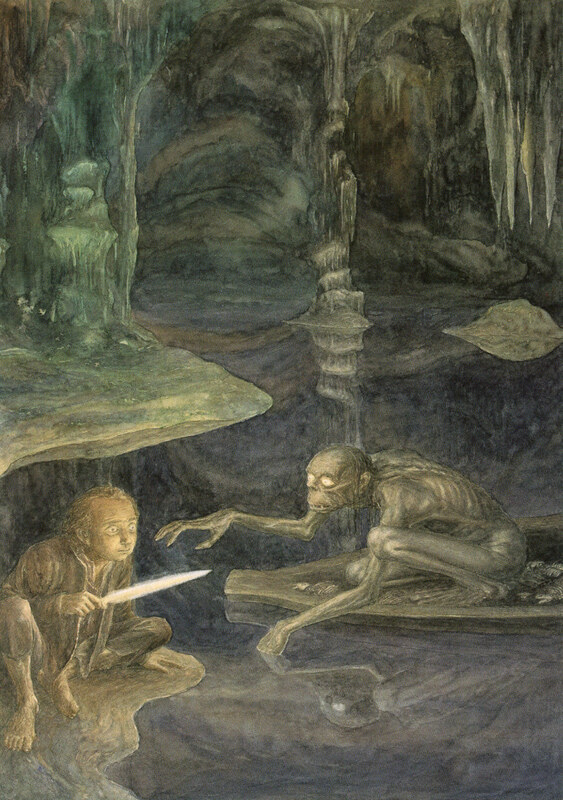 Bilbo finds himself at the bottom of a chasm with something mauling the struggling goblin, filling in that Gollum feeds on goblins when he has the chance. Martin shines throughout the whole movie as Bilbo, but here without the distraction of a swarm of dwarfs we really get to enjoy his performance, and Andy Serkis' performance embodies Gollum, providing the motion capture and the voice.